Yesterday I had the pleasure of running my first ultra-marathon at the Greenland Trail 50k in Larkspur, CO. But this race report begins, as most do, well before the starting line. My training leading up to this event was probably the most focused training I've ever had for a race. Now, that's not to say it was the best training, mind you. There have been plenty of times in the past that I've trained for a marathon by simply running balls-out fast for 7 or 8 miles a few times a week. But I never really understood my body and what was happening to it. This time, I had plenty of base mileage runs, as well as a handful of fartleks and tempo efforts. The training felt smarter. The morning of the race, as Alex and I made the hour drive down to the starting line form our house, we watched the sunrise into what would turn out to be a cloudless, bright, blue Colorado morning. Greenland Trail is an area of open space and grazing land that sits in a little valley just south of Larkspur, and it can be easy to overlook. After all, Pike's Peak looms large on the horizon above. But the beauty of the place itself is undeniable. Nestled at the foot of the mountains, the views are really stunning, and, as I looked out the window, I was reminded of why I opted for a trail event in the first place. The atmosphere at the trailhead was a perfect example of why I love these smaller events. We didn't encounter the anxiety-inducing security measures or throngs of people that greeted us at the Chicago Marathon last fall. Instead, there was a little dirt parking lot and a handful of volunteers helping us get our race packets and relaying any pertinent info. Alex could sort of amble about wherever she pleased, taking pictures and relaxing in the grassy spots. It's weird to say, but it felt like a family reunion more than a race with strangers. The race began, and I settled into a slow comfortable rhythm right away. The voices of so many ultra-runners from so many interviews were playing through my head on repeat: "Don't go out too fast. Don't go out too fast." So I didn't. I wore a heart rate monitor for this race, and vowed that I would try to keep my pulse in a comfortable aerobic zone for as long as possible. There was a pack of about 5 or 6 runners who seemed to have the same idea, so I settled in and ran with them. The 50k course at Greenland consists of four loops, each about 8 miles long. For my first loop, I naturally wanted to take a lot of mental notes so that I'd know what to expect for the rest of the afternoon. I paid close attention to the distance between aid stations, course conditions, and terrain features. And one feature became evident about 3 miles into the course: there was much more elevation gain than I was expecting. 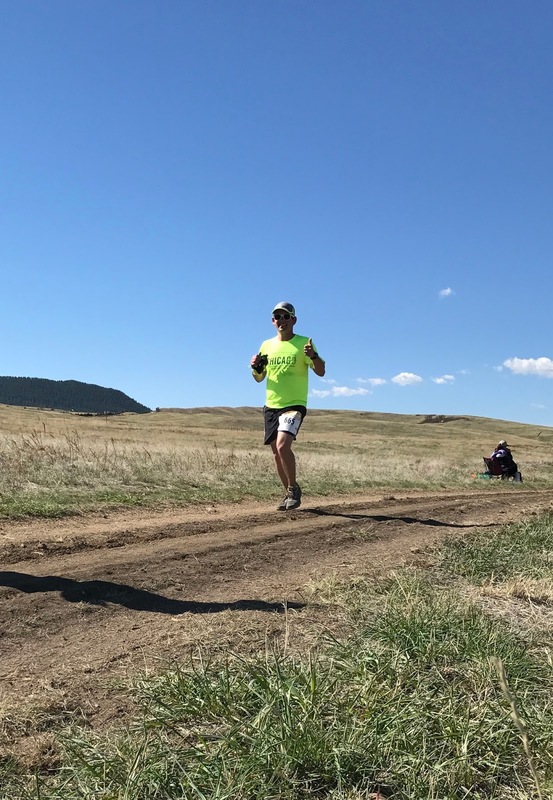 Mind you, it's not all that uncommon for ultras in Colorado to feature massive amounts of hills, but Greenland Trail is known to be a relatively flat, fast ultra. And, for me, coming from a road marathon background, it turns out that "flat" and "fast" apparently mean something very different. Much of my time on the uphill stretches was spent hiking more than running. In that first loop, another important factor made itself known: the weather. There wasn't a cloud to be seen anywhere, and, as I mentioned before, this race was on open space. As in OPEN. Zero trees. By 8am I was already starting to heat up. Near the top of the largest hill, I found a patch of rapidly melting snow nestled behind a grove of nearby bushes. I bent down, scooped up a handful, plopped it into my hat, and stuck my now giant hat back onto my head. It may have looked goofy, but the feeling of that ice cold water dripping down my neck as that snow melted was pure bliss. In that first loop, given the growing heat of the day and the hills, I happily put my ego to bed and threw my (already unrealistic) desire for a sub 5-hour finish out the window. It would be a day to simply learn and enjoy myself. During that first loop, I picked up a running buddy named Mike. Mike and his family live only minutes away from Alex and me in north metro Denver, and he was at Greenland running his first trail ultra, too. We settled into a pretty comfortable rhythm where we could chat and run at the same time, and I was incredibly grateful for it. Running too quickly too soon has always been an issue for me in distance events, but running with Mike made sure that didn't happen. Alex, meanwhile, had set up a little hangout spot next to the aid station and was waiting to take pictures and give me an emotional boost at the end of the first loop. I gotta say, it gave me something great to look forward to on the three remaining loops. I got in and out of the aid stations fairly quickly, stopping only to top off my handheld water bottle, grab a couple gels, and down a cup or two of gatorade. And speaking of the handheld bottle, I was SO glad that I went that route as opposed to the hydration pack. If I had to sip on warm water all day from a bladder and then wiggle that damn thing off my back at the aid stations to clumsily refill it, I would've been miserable. Plus, having the handheld allowed me to splash water over my head periodically as I ran. I can't stress it enough, I'm SO SO SO DAMN GLAD that I opted to use the handheld. As for the gels, I was taking one every 30 minutes, along with a SaltStick capsule every hour. The "real" food at the aid stations (muffins, chips, pretzels, etc) looked so appetizing, and I definitely would've indulged had this been a longer event, but gels had been sufficient nutrition for my long training runs, so I stuck with what I knew and relied on them to get me through. By the end of the second loop, the heat had gotten to be too much, so I ditched my shirt, lathered on some sunscreen that I had stored in a drop bag, and did my best Anton Krupicka impression for the final two laps. I was feeling pretty good toward the end of the third lap, and I wanted to finish fast, so Mike and I parted ways and I picked up my pace a bit for the final lap. Don't get me wrong, I was still walking up most of the hills, but I still had enough gas in the tank to (relatively) bomb down the downhills and make up a lot of that time. And ultimately I was able to do the one thing I love most in an endurance race: finish strong with good form and a smile.